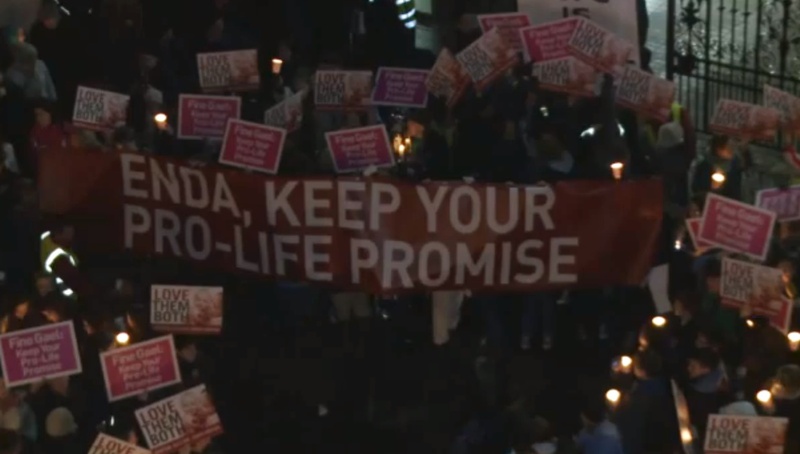 Over 10,000 gathered outside Ireland’s parliament this week to demand that Prime Minister Enda Kenny keep his campaign promise of 2011 not to bring legalized abortion into the Republic. The crowd included five Catholic bishops, and was organized by a united effort of all of Ireland’s pro-life organizations. 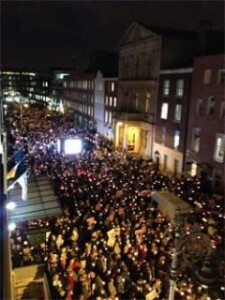 The thousands, chanting “Keep your promise!”, packed Molesworth Street in central Dublin, holding placards urging the government to protect both mother and baby. The crowd was addressed by Niamh Ui Bhrian and Dr. Sean O’Domhnaill of the Life Institute, and Caroline Simons of the Pro-Life Campaign, who said that the politicians would face a massive public backlash if they attempted to overturn the country’s constitutional protections for the unborn. The Life Institute is preparing to follow the rally with a massive, nationwide campaign that includes getting 1.4 million leaflets into every household in the country warning that Kenny and the Coalition are preparing to “open the door” to abortion on demand, and that promises of “limitations” are nonsense. “Everybody in the country is going to get a message. Kenny is going to get the message,” Ui Bhrian told LifeSiteNews.com. 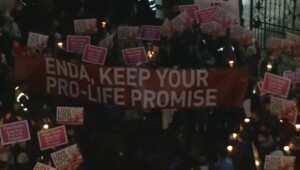 The rally was held in response to threats by the coalition government to bring forward legislation to allow abortion. Since the ruling in 2010 by the European Court of Human Rights on the A,B& C case, Irish politicians are said to have been in a state of chaos over abortion, with pressure from the global abortion lobby on one side, particularly at the European Union, and a public that opposes liberalization of the law on the other. Although the ECHR ruling specifically said that the country is not under an obligation to legalize abortion, this has not stopped abortion lobbyists in the Dail, largely from Labour Party coalition partners, from insisting that the government legislate to allow abortion in “limited” circumstances. The media’s treatment of the death of Savita Halappanavar has only increased the pressure, leading to promises to bring in legislation before Christmas. Simons and other pro-life leaders are adamant, however, that the government’s promises of “limited” abortion are meaningless. “Once the principle is conceded that every human life has an inherent unrepeatable value, there is no going back. What has happened in other countries proves that there is no such thing as restrictive abortion,” Simons said. “In Britain, abortion was introduced on narrow grounds, but is now legal up to birth. Babies who survive the abortion procedure and can breathe unaided are simply left to die. Just last week it was reported in Canada that 491 babies who survived abortion between 2000 and 2009 were left in a corner to die after receiving no medical care or attention. “That is the true barbaric picture of legalised abortion,” she said. Niamh Ui Bhrian told LSN that the rally was just the start of a campaign to reverse the work of the media propagandists. “For the last three weeks people have had this non-stop propaganda,” saying that the pro-life laws threaten women’s lives, that they need legalised abortion to be safe. This, she said, is “absurd” given the rating of Ireland by the World Health Organisation as number two in the world for maternal health with those laws in place. Pro-life people are fed up with the propaganda, she said, “they needed to come out in massive numbers and tell the government to keep their promise.